This #GivingTuesday we should not forget that 20 million Americans are at grave risk of having their health coverage yanked away. We at Citizen Action of Wisconsin, working with top health advocates from across the country, are planning an unprecedented campaign to sound the alarm bells and spark the kind of intense public backlash that can stop Donald Trump and Congressional Republicans in their tracks. 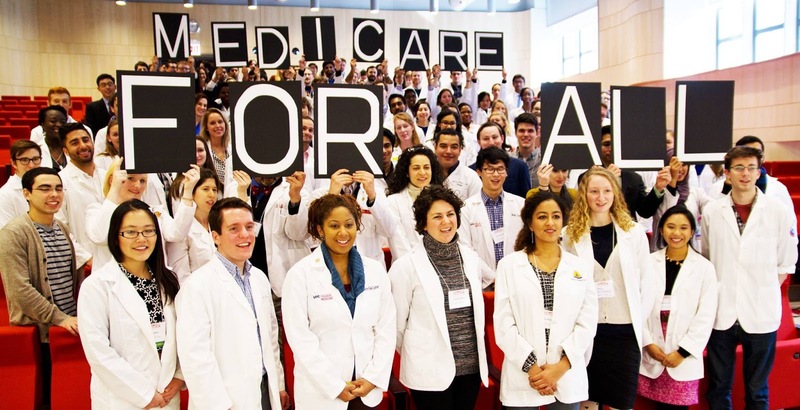 Join us now by giving to our tax-deductible Citizen Action’s Health Care Emergency Fund! Can Paul Ryan actually privatize Medicare? "We need it as soon as possible, starting in California and leading to a national health program based on the Medicare model — improved and expanded Medicare for all, cradle to grave, sperm to worm. A huge risk pool that can cover everyone with great benefits, including dental and vision, paid for with a modest tax on individual income and business payroll (like Medicare), replacing all the unpredictable, escalating expenses we pay now. Medicare for All is the answer. 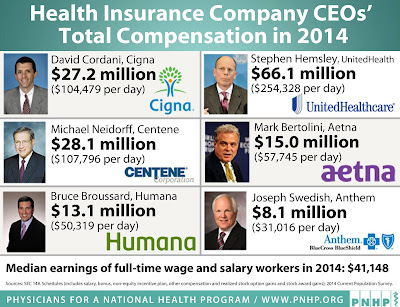 Take the profit hording insurance companies out from between me and my doctor. 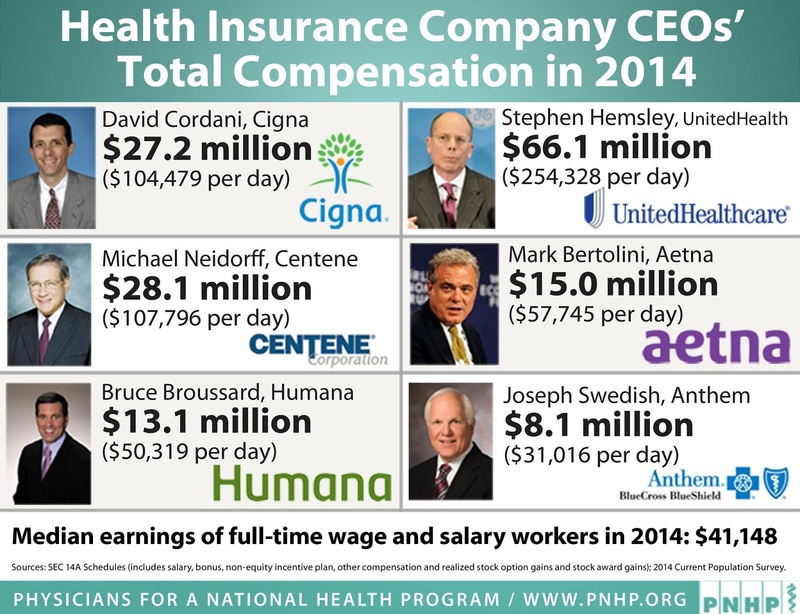 Corporate profit seeking execs / companies have no added benefit in health care - just like they would not in my access to police protection, fire dept. calls, patching that pot hole, the Armed Forces or my local public school. "Clearly, America needs to progress to a national plan that covers everyone — a system strong enough to drive prices downward. Health care should be a human right for all people." 1. Colleagues are, more than ever, receptive to the single-payer message. 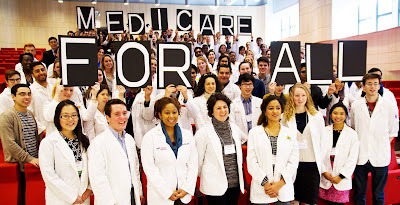 Let’s talk about it in corridors, conferences, lecture halls and national meetings; use Facebook, Twitter, email and snail mail to recruit new PNHP members; and push journal editors to end their virtual blackout on single payer. 2. With Medicaid under attack, in many states we’ll need to join in its defense. But we must simultaneously declare that this halfway measure is no substitute for real reform. Let’s not repeat the error of ACA backers who tried to convince people that their health care problems had been solved. Similarly, defense of Medicare should not paper over that program’s flaws. 3. We need to help focus the anger at elites onto the real health care elites: insurance and drug firms, and corporate health care providers. 4. In the past PNHP has focused narrowly on single-payer reform, avoiding participation in most broad-based coalitions. We should reconsider that stance in the context of the broad opposition to the Trump regime, and the urgency of threats to our communities. Effective action will require coalitions that span many issues. We should participate in those that include a demand for single payer. 5. It’s time to ramp up organizing for H.R. 676. Politicians can no longer seek refuge in the fiction that health reform is a “done deal” and is working. 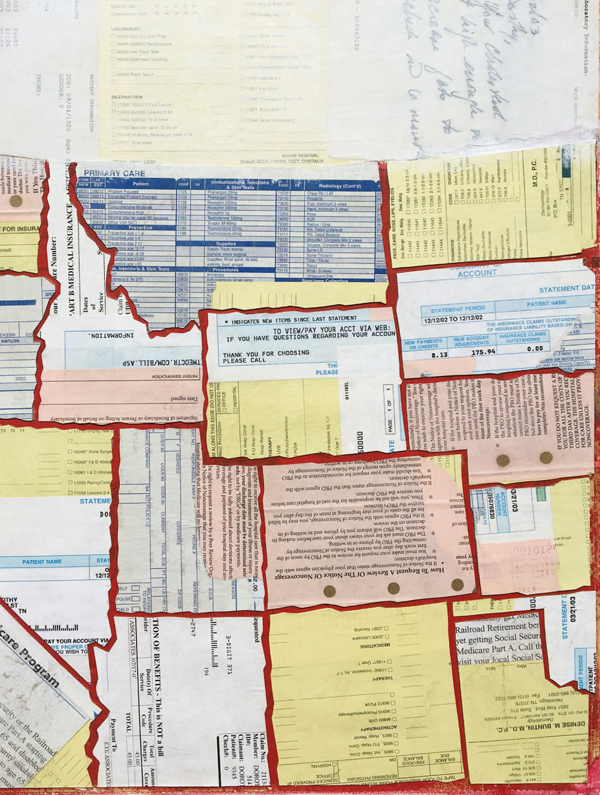 While work for state-based reforms can provide a useful organizing tool, it cannot address the nation’s most acute health care problems, which are concentrated in states with little hope of local legislation." ".... expanded access to health insurance to millions of Americans did so without nearly enough input from the patient — or the doctor. “Patients are getting frustrated and fearful and anxious that they can't have access to the care that's best suited for them,” Noseworthy said. “How can you have a great country if our citizens can't get access to world class health care? It's actually not a bad time to reassess.”"
Another way profit driven systems cost us so much in health care. Not only the insurance companies. 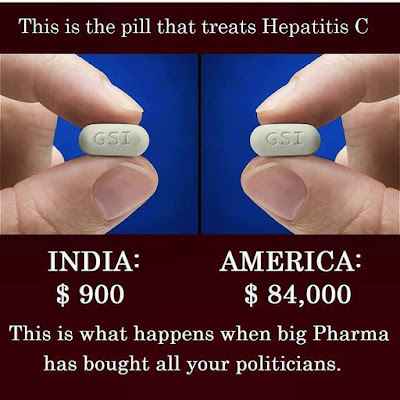 Why Single-Payer Has Never Succeeded in the U.S.
"Bloomberg reports that a federal inquiry into drug price-fixing is looking at more than a dozen companies and about two dozen drugs. I hope that inquiry expands, and results in real action. Drug prices in the U.S. are higher than in any other advanced nation, and drugs are the fastest-growing part of the health care bill—which itself is rising at an alarming rate. This means fat profits that come out of your pocket, both as a consumer and taxpayer. The combined profits of the 10 pharmaceutical companies in the Fortune 500 were over $35.9 billion last year -- more than the profits of all the other 490 businesses in the Fortune 500 put together. Drug companies say the big profits are necessary to support their research in new drugs. Baloney. They’re spending far more on marketing drugs than on developing them - in some cases twice as much. Besides, profit margins take into account R&D costs. 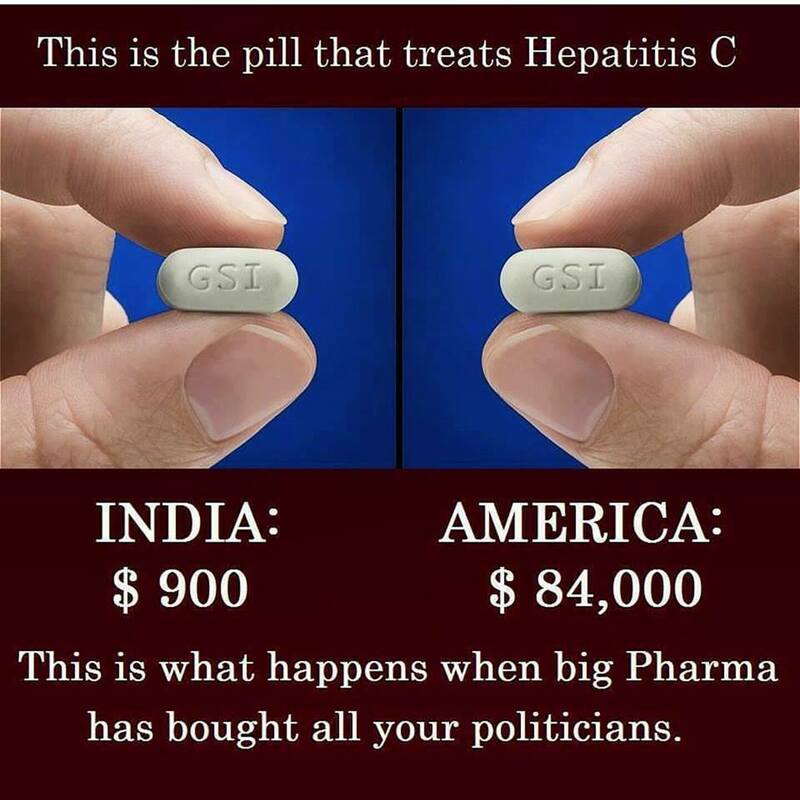 We must regulate drug prices, like every other advanced nation. And push for a single-payer healthcare system." Need to watch for the Rand Corp study results planned to come out in Dec.
"If it seems like Big Pharma has escaped accountability for its role in perpetuating the nation's deadly opioid epidemic, those suspicions are not unfounded. 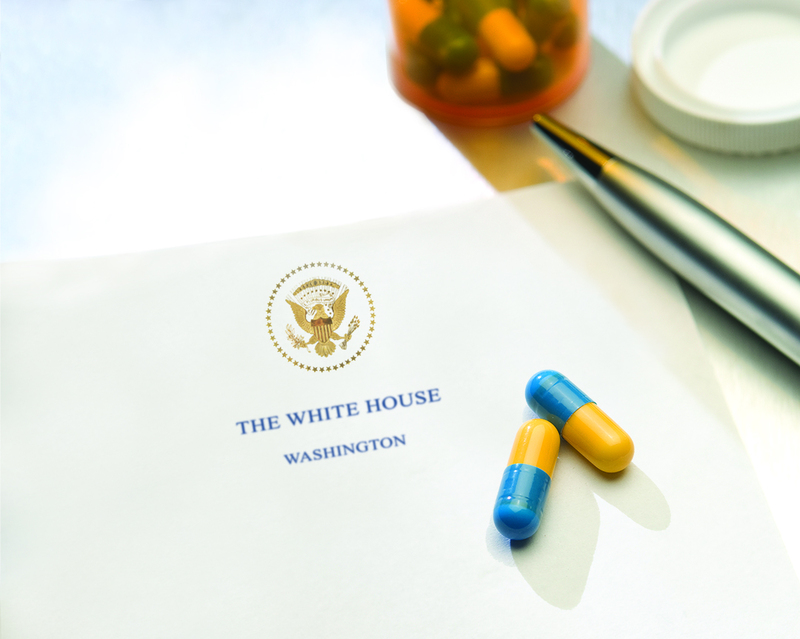 According to a former top Drug Enforcement Administration (DEA) official, the industry's influence over Congress has successfully quashed efforts to regulate the pharmaceutical drug market aiding an unprecedented addiction to legal drugs." I really like how the author lays out in simple terms what the health care issue is all about. An example: "No approach to getting health care for everyone is ideal. Getting sick isn’t ideal. None of this is ideal. But an every-person-for-herself approach is a guaranteed failure when going up against corporations who will offer care on their terms. What if a pool that’s run by elected officials is the only way to create an entity that has no incentive to deny our medical claims? No incentive to charge us as much as they possibly can?" he understands the difficulties of moving the process in that direction. should listen to Jacob Hacker to see what he has to recommend. one Senator was able to block it altogether. hardly be described as successes of ACA since most people are worse off. insurance competition would dwindle and premiums would skyrocket. consider it as a program for all of us. 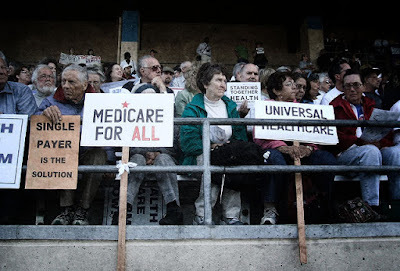 we enact a public option it will lead to the left’s dream of a single payer system. public option is not a threat to a system of competing private plans. through the exchanges will be able to choose a feeble public option? only one insurer in their exchanges. 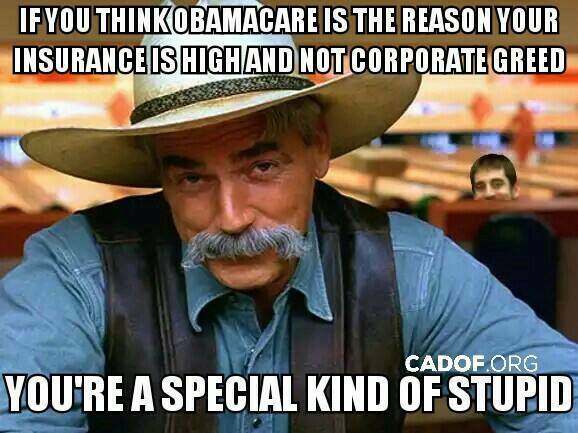 conservatives with this bastardized form of “single payer”). to patients with greater needs. Death spiral? innovations, but only those that have been proven to be effective. very helpful if there is no one there to care for you. again, and Hillary Clinton has embraced it. compete with a public option. they have in Switzerland - can work if they are very heavily regulated. our own single public plan. for a system that works? last decade - from 6.6% to 10.1%. though most will have the option to shop for lower premium plans. to gain greater market share (though they will never admit this). access due to lack of affordability. any of the defects that have made our financing system so dysfunctional. And who pays those taxes? A bit of a shell game, I’d say. reducing access to the care that patients should have. Bad policy. payer people think of that? Oh. They did. 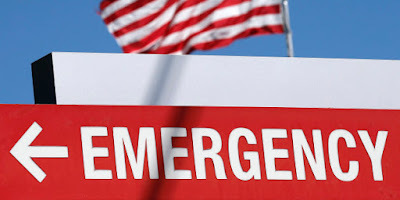 "The most likely scenario to come out of this latest batch of Obamacare bad news is a few tweaks here and there -- but that's not going to do much in the long run. One, we can either create a public option to inject some real competition into the market place, OR we can work towards single-payer, i.e. Medicare-for-all. Complete repeal is not an option - not when Obamacare is already in place and so many people have benefited and continue to benefit from it. We can - however - use it as baseline to move forward." "And physician compliance and paperwork burdens are being exacerbated by emerging reimbursement methods. 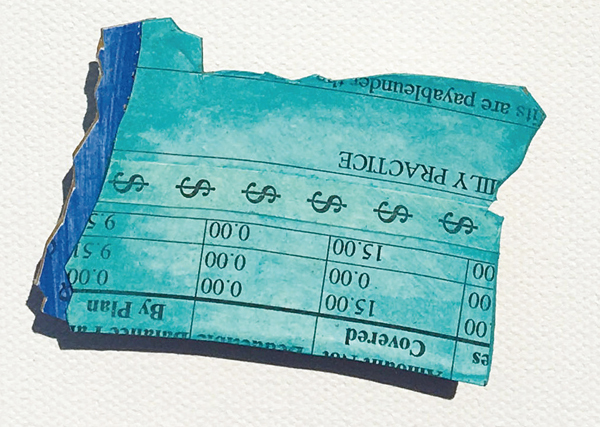 New value-based payment models, such as the aforementioned MACRA, require physicians to track countless “quality measures.” Combined with EHRs, the overall effect serves to divert physician eye contact with patients – something both parties increasingly resent. Unfortunately, as all physicians know too well, they often find that their ability to choose what is best for their patients is compromised or obstructed by bureaucratic requirements or third parties who are non-physicians and neither have the training nor the knowledge of the patient that the physician possesses. They also force physicians to be box checkers instead of maintaining important eye contact with their patients. When NASA first started sending up astronauts, they quickly discovered that ballpoint pens would not work in zero gravity. To combat the problem, NASA scientists spent a decade and $12 billion to develop a pen that writes in zero gravity, upside down, underwater, on almost any surface including glass and at temperatures ranging from below freezing to 300 degrees Celsius. The Russians used a pencil. " "Gov. Scott Walker and the Legislature's opposition to the law is projected to cost $678.6 million in state tax dollars through the 2017 fiscal year. That's because Wisconsin is the only state in the country to use the Affordable Care Act to expand its Medicaid program while turning down the additional federal dollars available through the law to pay for it." "Until we recognize that the largest possible risk pool is required to implement universal coverage in the public interest, and that the private health insurance industry is on a death march, we cannot make necessary health care available to all Americans. 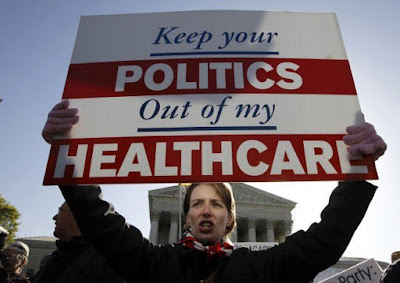 Can’t we get to real health care reform on a nonpartisan, win-win basis?" Change can happen State by State. Another of the many examples of how things that earn some folks money in the complex things that get between me and my actual medical care have no purpose related to my health and make it cost more for all of us. First reaction = Duh! But, we need to remind ourselves that our U.S. poor stats on health care compared to other countries is because of our view of poverty. It has happened with public education, with law enforcement, pollution AND with access to health care. Many in our country, and too many in control of our country, have been brainwashed to believe poverty is caused by weakness in THOSE people. The ones doing the brainwashing are in the 1%. 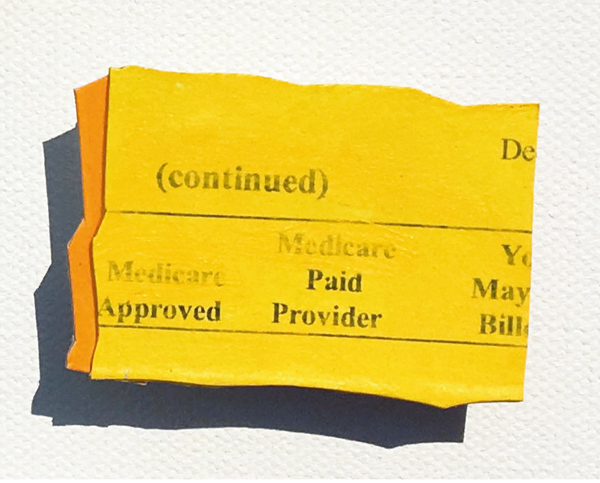 Can fixed payments transform the health care industry? This has the risk of "bundled payments" being the new ACO or MCO. But, it does point out that total health care costs for individuals and the "system" involve much more than the insurance companies pay attention to. Incentives to keep folks in nursing homes is just as bad as incentives to restrict access to care under and ACO. ACOs are nothing more than the old, failed, Managed Care Organization model. 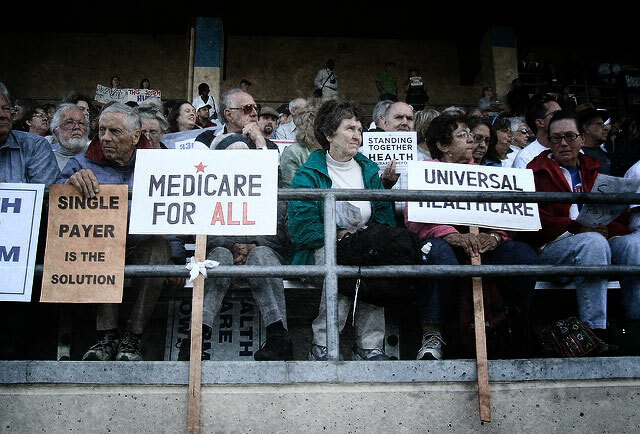 Is single-payer health care on America's horizon? Most of us call them states. Some states — most notably Vermont — have investigated building a single-payer system for health care consumers within their borders. 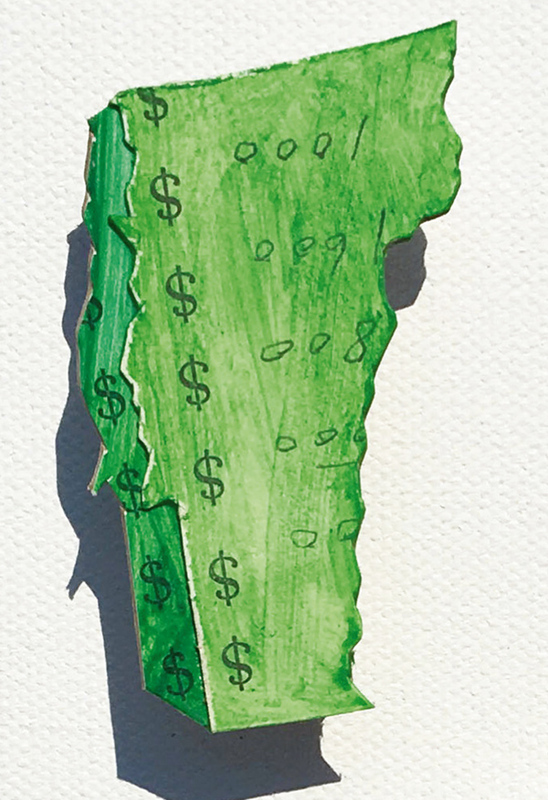 However, the hurdles were too great to overcome in the Green Mountain State and Gov. Peter Shumlin had to put a halt to single payer due to a very high price tag in 2014. Fast forward to the 2016 presidential election cycle, and the issue again cropped up in the campaign of Vermont's own Bernie Sanders, who made universal health care a central plank in his socialist-minded platform. Like a few other states, Colorado has a ballot initiative process to bring questions directly to voters. 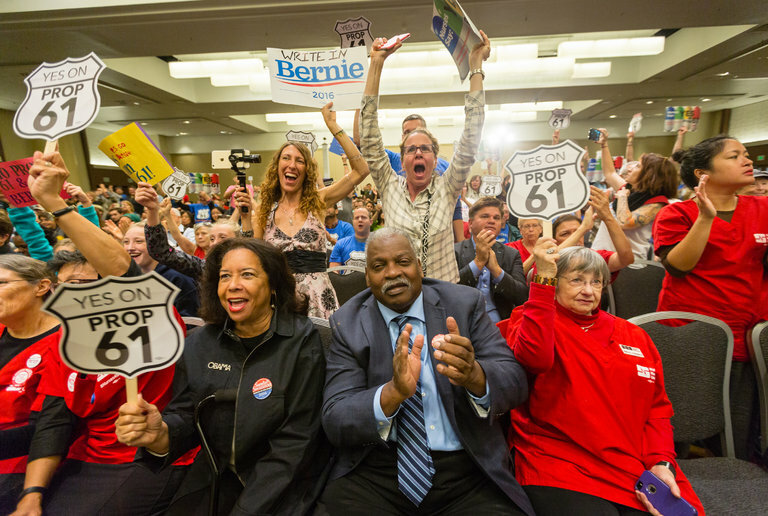 Proponents of a universal system gathered 156,000 signatures—more than enough for the initiative to appear on the ballot—in support of adding what's known locally as Amendment 69 to the ballot. If passed, the measure would add a 12-page amendment to the state's constitution and create ColoradoCare. In essence, Amendment 69 would create one large insurance group for the state that would be governed by ColoradoCare's elected board of 21 trustees. 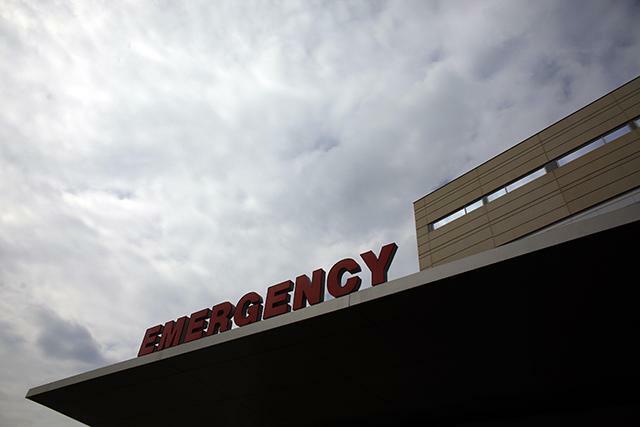 Proponents call ColoradoCare a universal plan because some payers, such as Tricare, Medicare and Medicaid, would remain in place. In these instances, ColoradoCare would act as a supplemental policy. 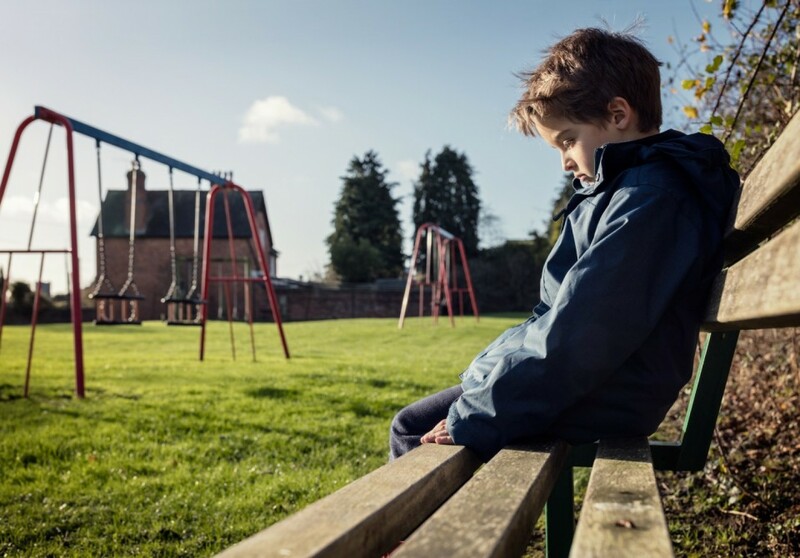 According to ColoradoCare's website, the system would cover primary and specialty care; hospitalization; prescription drugs and medical equipment; mental health and substance use services, including behavioral health treatment; emergency and urgent care; preventive and wellness services; chronic disease management; rehabilitative and habilitative services and devices; pediatric care including oral, vision and hearing services; laboratory services; maternity and newborn care; and palliative and end-of-life care. Under ColoradoCare, there would be no deductibles and designated primary and preventive care services would have no co-payments. ColoradoCare would replace the state's health insurance exchange. ColoradoCare proponents see health care as a fundamental right, like education and fire protection. They believe the system would reduce the overall amount Coloradans spend on health care, while improving quality and providing coverage for everyone. The system's backers estimate that 80 percent of Coloradans will pay less under ColoradoCare. According to ColoradoCare's projections, the savings would come from reduced administrative costs, while increased purchasing power would give the system the ability to more aggressively negotiate prices with drug and medical equipment makers. Perkins also points to ColoradoCare's independence as a main benefit of the system. After attempts to push health care reform through the Colorado state legislature failed, architects of universal health care not only went with the ballot initiative process, they also proposed a system that's largely free from government and private industry. However, the state would be responsible for collecting start-up taxes and the full tax if Amendment 69 were to pass. Kirke also points out that Amendment 69 could have a more far-reaching impact on Colorado's economy than just the benefits industry. In recent years, the state has seen exploding economic and population growth. Kirke believes that Amendment 69's passage could give business owners pause as they consider Colorado when starting or re-locating their businesses. Colorado's experience with Amendment 69 may well serve as an example for others working to institute a universal health care or single-payer system at the state level. Know your options on the ballot. There is information out there. "What was really important to me was deciding about other independents,Democrats and Green Party candidates. I have a “close to my heart” list that includes things like single payer health care also known as universal health care or medicare for all. We recently visited my in- laws in Canada, great couple. My sister in law has fought tooth and nail to become a truly dynamite woman. She remarried a few years ago to a wonderful man. He went for an annual physical a while back. It revealed a serious cardiac problem that required a quadruple by pass. In the United States this is a death sentence for some without really good insurance and deep, deep pockets or it means a lot of debt. For my brother in law it meant he got the surgery he needed and didn’t have to liquidate everything the family owned and still be in deep debt." The Washington Post article seems applicable to Minnesota and our State Commerce Department. With the latest increases in the state’s individual health insurance market it appears the Commerce Department just goes along with the health insurance industry. See the StarTrbune article link below. It’s time the Commerce Dept. stops catering to health insurance companies and starts working for the people of Minnesota. 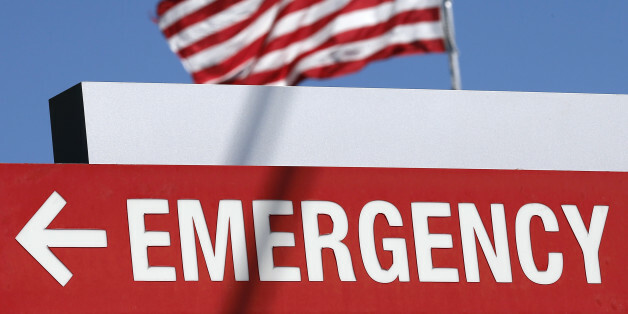 Our state government needs to step up to the plate and solve our healthcare financing crisis. Help spread the word that is unacceptable to let the MN health insurance industry dictate how we finance our healthcare system! "Obamacare faces a major test in the fourth annual open enrollment season, which starts on Nov. 1, a week before Election Day. In many counties, consumers will see higher premiums and fewer insurers -- as Aetna, Humana and UnitedHealth have backed out of the exchanges. 1. Trump and many other Republicans want to repeal it altogether and substitute – what? I keep hearing about a "block grant to the states," which is Republican shorthand for "kill it." 2. Some Democrats want to resuscitate a “public option” (remember that?) 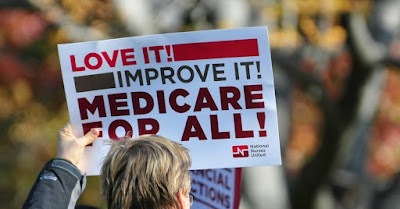 which would allow people to buy into a version of Medicare. Insurance lobbyists already are mobilizing to kill the public option, as they did when it was first considered as part of Obamacare. 3. The only sensible direction is a single-payer system. 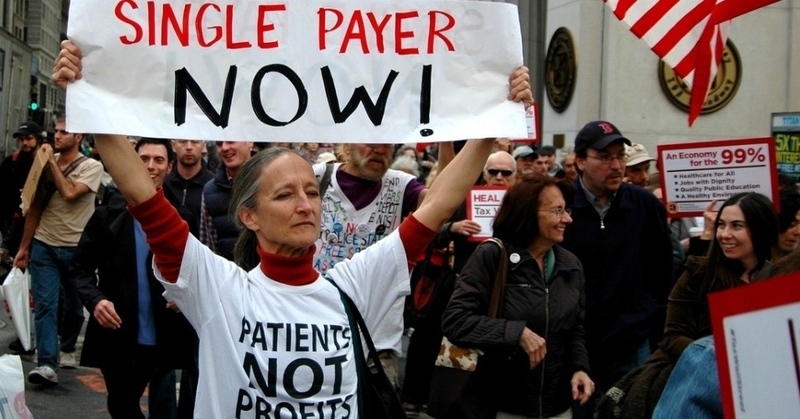 A public option could be a step toward it, but the single-payer must be on the table as well. It has large and growing support. Bernie's campaign helped educate the public about its importance -- and inevitability." Need to outlaw corporations giving campaign $ and lobbying Congress and State Legislatures. This is a good health care example. 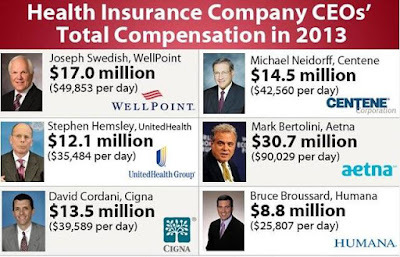 Insurance companies also spend millions on this. We need to treat access to health care as a right and the drug issue as a health care problem. Money is behind what we have now. 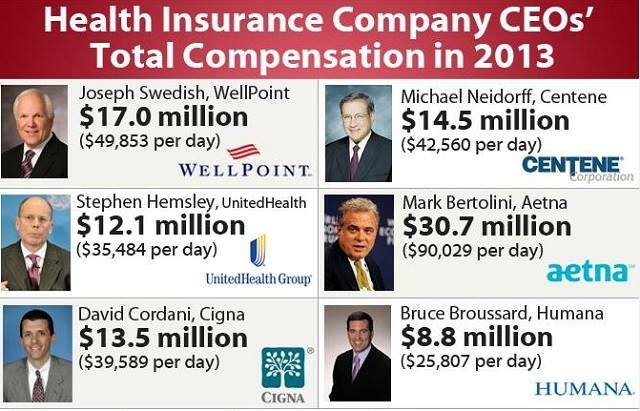 Insurance companies are out to make a profit and their execs are out to make millions personally. My personal access to health care is NOT in their best interest. Take their money out of the system and move it into covering all and we will spend less with better outcomes. Prisons have become profit sources for corporations. Some are owned on run by corporations. Many sub-contract a lot of services to for-profit business, (food, maintenance, telephone access, etc. are examples). Incarceration as a response to drug use does NOT reduce the problem. In fact, it makes it more criminalized by being a 'school' on how to be a criminal and reducing the likelihood of being able to be legally independent and self supporting when released. Money spent on jails and prisons can be reduced and shifted to Portugal's type drug response. It would be less expensive and have much better outcomes. We sure have a lot to learn from other countries. Join us on September 19 at the Southdale Library at 6:00 PM for a presentation on Minnesota progress toward Affordable Health Care for All. Joan and Steve Januzs will explain about Single Payer, Universal health care, legislative issues, and what is happening with this important issue in out State.